Definition: Rubella, also called German measles or three-day measles, is a contagious viral infection best known by its distinctive red rash. Aside from the rash, people with German measles usually have a fever and swollen lymph nodes. The infection can spread from person to person through contact with droplets from an infected person’s sneeze or a cough. A rash may start around two weeks after exposure and last for three days. It usually starts on the face and spreads to the rest of the body. The rash is sometimes itchy and is not as bright as that of measles. In adults joint pain is common. Complications may include bleeding problems, testicular swelling, and inflammation of nerves. Infection during early pregnancy may result in a child born with congenital rubella syndrome (CRS) or miscarriage. However, rubella is caused by a different virus than measles and is neither as infectious nor usually as severe as measles. Congenital rubella syndrome can disrupt the development of the baby and cause serious birth defects, such as heart abnormalities, deafness, and brain damage. Rubella is a contagious, generally mild viral infection that occurs most often in children and young adults. Rubella is the leading vaccine-preventable cause of birth defects. Rubella infection in pregnant women may cause fetal death or congenital defects known as congenital rubella syndrome. There is no specific treatment for rubella but the disease is preventable by vaccination. Rubella is preventable with the rubella vaccine with a single dose being more than 95% effective. Often it is given in combination with the measles vaccine and mumps vaccine, known as the MMR vaccine. 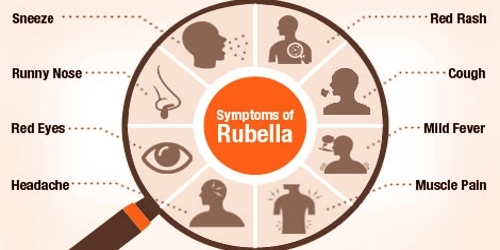 Causes, Sign, and Symptom of Rubella: Rubella is caused by a virus. It used to be called “German measles,” though it’s not caused by the same virus that causes measles. It can spread when an infected person coughs or sneezes or it can spread by direct contact with an infected person’s respiratory secretions, such as mucus. It can also be transmitted from pregnant women to their unborn children via the bloodstream. The virus is transmitted by the respiratory route and replicates in the nasopharynx and lymph nodes. The virus is found in the blood 5 to 7 days after infection and spreads throughout the body. The virus has teratogenic properties and is capable of crossing the placenta and infecting the fetus where it stops cells from developing or destroys them. People who have German measles (or Rubella) are most contagious from the week before the rash appears until about two weeks after the rash goes away. They can spread the virus before they even know that they have it. Children with CRS can suffer hearing impairments, eye and heart defects and other lifelong disabilities, including autism, diabetes mellitus, and thyroid dysfunction – many of which require costly therapy, surgeries, and other expensive care. Complications of Rubella: Rubella is a mild infection. The most serious of these could happen during pregnancy when the virus can pass from mother to baby in the womb. The risk is highest during the first 3 months of pregnancy. Some women with rubella experience arthritis in the fingers, wrists, and knees, which generally lasts for about one month. In rare cases, rubella can cause an ear infection (otitis media) or inflammation of the brain (encephalitis).